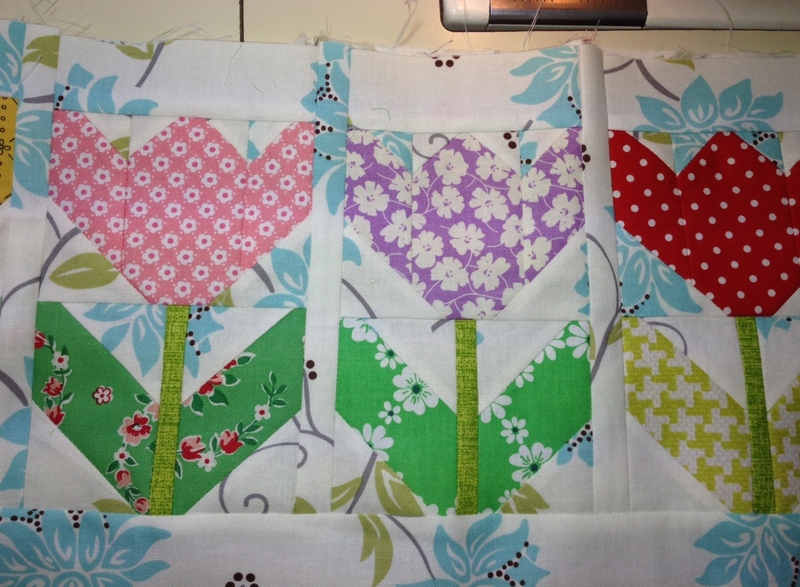 Well, I realized after making these tulips that I do best work on my own pattern/projects. I made so many mistakes making these I almost don't want to show them. The tulips were fun to make but I realized (yet again) while making these, I'm not a very precise sewer. When there are lots of little pieces, this problem works against me. So you may notice my tulips do not look like Lori's. You can see I didn't stagger them. Mine are in a straight line instead of up and down. Whatever, I realized this after getting my entire row all finished. I didn't want to unpick. So I didn't. 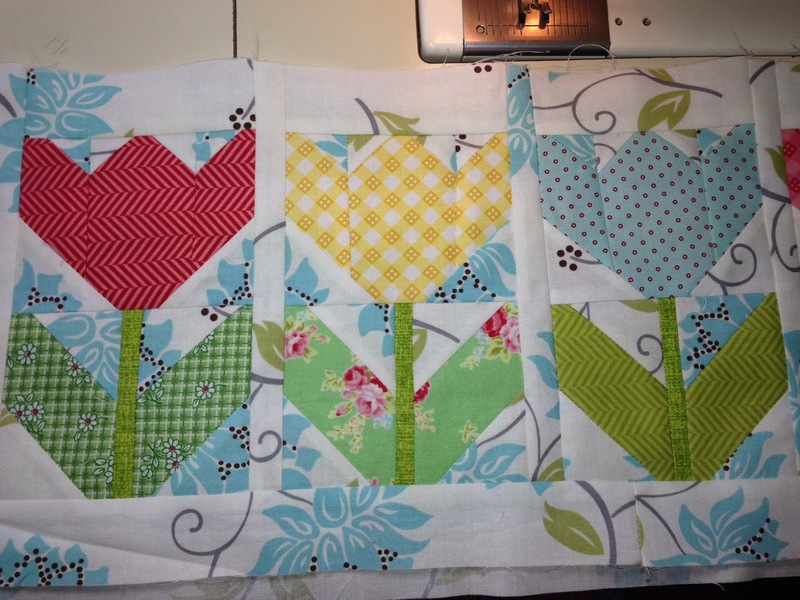 I loved picking out the fabrics for the tulips and overall I think they turned out ok. They all seem to be leaning to the left, however. Note, my inprecise sewing. I'm happy that I've finished my last row in this project. 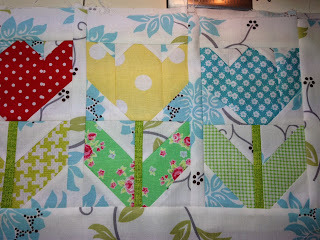 It will be good to get my rows together and get this project to the quilter. Oh wow, you can really tell how badly they lean in this photo. Complain, complain. My own fault. I have to remind myself as my friend Flora says: "It's only fabric." They are not leaning they are blowing in the spring wind, problem solved. Oh, not to stress so - I like the others' comments - blowing in the breeze. My tulips never grow straight. And it is your quilt, so if you want them growing in a row that is fine - I didn't alternate my butterflies and I am opting to leave one of the smaller rows out - or replace with something else. Love Love your tulips! The fabric choices are great!! Wish I had joined in this quilt along, but alas, too many projects and not enough time! Darn it Nanette, you keep tempting me with starting a new project. You and Lori need to stop with all the cuteness because I'm having a hard time resisting! I think they're lovely! I wondered how they would look lined up rather than staggered, because I'm the kind of person who needs everything in a row ... not just on quilts, but everywhere ... and I like them! I really appreciate your blog today! I always think your projects look perfect and your tulips look perfect to me! It makes me feel like I can be more accepting of my own work when I read your blog! Don't be so hard on yourself - they look great! Love your background fabric - lotsa fun! They look good from here! 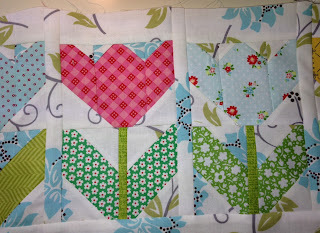 I just finished sewing my rows together, and the Row Along has been so fun to make with everyone. I've loved seeing your wonderful fabrics and backgrounds. From the comments it looks like you are in good company, myself included! I have a problem reading and following directions. I figure it looks simple enough and then uh-oh I find myself in trouble. I think it's a good call not to unpick, they are lovely just the way they are! I think your tulips are perfect. They're blowing in a nice spring breeze. Yep, you are entirely too hard on yourself. Your tulips, and all the other rows, are just gorgeous! Your tulips are pretty, Nanette! I like the colors and different prints you are mixing. This is going to be a playful and fun quilt when all the rows come together. I think they look wonderful Nanette and I like them even better than the staggered rows! I sewed my rows together without sashing at first. But the tulips were hard for some reason. I think it's the mirror image of the corner triangles. I struggled with these for sure. Yours are still cute, your quilter can quilt it out.